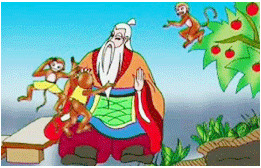 Once upon a time, there lived an old man in Song Kingdom, who raised a lot of monkeys at home. The old man fed each monkey eight acorns every day, four in the morning and four in the evening. Later he fed so many monkeys that he had not enough acorns. So he wanted to feed monkeys seven acorns each day. Then he discussed with his monkeys, “From today on, I will give each of you four acorns in the morning and three acorns in the evening. Is that O.K. ?” Hearing this, all the monkeys got angry. How come lack one in the evening? Then the old man changed to say, “I'll give each of you four acorns in the morning and three acorns in the evening.” Thinking that there were still four in the evening, all the monkeys became happy again. Three in the morning, four in the evening: The idiom originally means to fool others by playing tricks. It later extends to mean changing one’s mind frequently or not being responsible. Once you have an object, do not chop and change, otherwise you'll accomplish nothing. He's already got a girlfriend, but he still dates to "play fast and loose ", so his girlfriend parts w/ him.